If you’ve noticed that not every text message sent to you on your Samsung Galaxy S8 is getting through, you’re not alone. Numerous other users are reporting the same issue. In threads on Reddit, users across Verizon, AT&T, T-Mobile, and Sprint are all reporting that some messages people have sent to them aren’t being received, or that there’s a delay in getting them. This seems to happen regardless of which SMS app is used. Some users report that services that push message alerts to your computer momentarily show the messages, so they are coming through, but for some reason aren’t being displayed on Galaxy S8 handsets. Anecdotally some users are saying that if they disable ‘Advanced Messaging’ in Samsung’s own SMS app the problem is solved, but others are still reporting missing texts. Samsung, for its part, knows about this "limited" issue, even if it doesn't have a specific solution for everyone at the moment. 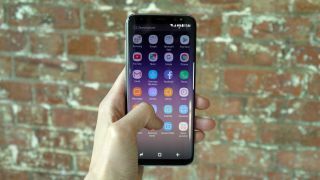 “There are multiple conditions that could contribute to issues with SMS messaging on mobile devices," a Samsung spokesperson said in a statement sent to TechRadar. "We have received a limited number of inquiries from customers about this and are working with each of them individually to address their questions and trouble shoot their issues. "We will continue to promptly investigate and resolve any issues brought to us by our customers. Customers with product questions or issues should contact 1-800-SAMSUNG so that we can help them." It’s not clear how widespread this problem actually is. Although there are a number of threads on Reddit about it the number of posts probably doesn’t exceed a few hundred, so it may well be that not all that many users are actually having this problem. It may also be a regional issue, as most users reporting the issue are on US networks, though one we’ve seen is on Rogers in Canada and having the same issue with their Samsung Galaxy S8 Plus. Whatever the reason and however widespread, the good news is that this sounds like it’s something Samsung will probably be able to fix with a software update, so even if you aren’t getting all your messages you likely won’t have to repair or replace your phone, you’ll just have to wait for a fix. Hopefully you won’t have to wait for too long, especially as this phone is sitting in our best phone ranking.